Over the next few months, we will be featuring restaurant industry leaders and influencers that will hopefully inspire you and your path within this delicious industry. Be sure to follow them on Instagram, Twitter and/or Facebook! 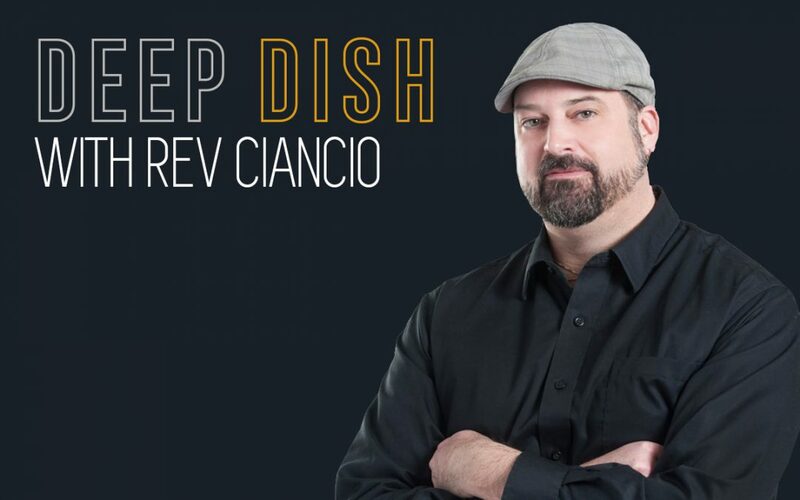 Our second featured post in our “Deep Dish” series is with Rev Ciancio. Over his 20+ year career, he has managed business development, digital marketing, and social media strategies for a wide range of entertainment and hospitality companies. When not preaching the gospel of Digital Knowledge Management, you can find Rev discussing the virtues of what makes a truly great hamburger — along with local business marketing tips — on his Instagram account @revciancio. Before working at Yext, Rev was the owner of an agency that successfully helped small businesses with local marketing. He also used to own a bar and restaurant in New York City, so he knows exactly what it’s like to operate a small business. 1. Tell us a little bit about your background and how you got to where you are today. I’m a former agency owner, former NYC bar owner and very passionate about food and marketing. Prior to my life at Yext I was the director of marketing for a ground beef manufacturer. One of my primary roles was to provide marketing consulting like services to their best restaurant customers which comprised of very large international chains all the way to local mom and pop shops. Those businesses could ask me questions like how should they manage their ratings and reviews, what was the best way to hire a PR person or what was a good social media strategy. I’ve been doing some form of food blogging or another since 2004 when I started a website about cheesesteaks. That’s long gone but I ended up writing one of the top 3 Burger blogs in the world. Burger Conquest. I stopped reviewing restaurants when I took the job with the ground beef company and instead started writing hospitality and influencer marketing tips. I promote them through my main Instagram account, @revciancio as well as my instagram account dedicated to french fries, @funwithfries and my account dedicated to some of the most elite Burger eaters in the world, @theburgeratti. When I was giving marketing advice to the customers of the manufacturer, one of the things I was suggesting to the them was that they manage their digital knowledge, that is all the public facts about their business like their name, address, phone number, hours of operation, menu and more, everywhere that information lived on line. That’s when I found about a Yext. a software based cloud solution that could help them in their efforts. When I left the hamburger manufacturer I started a consulting business that managed digital knowledge for restaurants using Yext. Yext took quick notice and asked me if I wanted to come help them help their customers. I love marketing, I love the hospitality business and I love helping others with their marketing so I jumped at the chance to learn more, do more and help more. 2. When it comes to food trends, what has been the most bizarre and the most exciting item that has hit the industry in recent years? Poke. I don’t get it. But then again, I don’t like seafood and I have a rocky relationship with vegetables. The rainbow foods thing escape me as well. I swear Im a happy and positive person! 3. As a chef, what do you do to keep your skills fresh? Listen, read, ask questions and learn, learn, learn. I read blogs, reports, surveys, whitepapers and other sources of thought leaderships, stats and guidance almost daily. I devour several podcasts a week and never, ever stop asking questions to people with less, similar and more experience than me. I also look beyond my own industry. Studying what others like you do and only those people will just turn you into a copycat. 4. Who is your biggest inspiration as to how you got into the field of food? The easier answer is part 1, my father. He had a profound effect on my desire to help others, always be learning and to be passionate about restaurants. Part 2, my mother. She taught me to be organized, introspective and how to cook. Throughout my career I haven’t had just one person who has inspired. In each part of my career a different person has been pivotal to my growth. In college, Gary Reid, the Director of Undergraduate Studies at Michigan State University and GM of the college radio station, WDBM where I served as program director took me under his wing and taught me anything I asked. I still talk to Reid today and never stop learning from him. 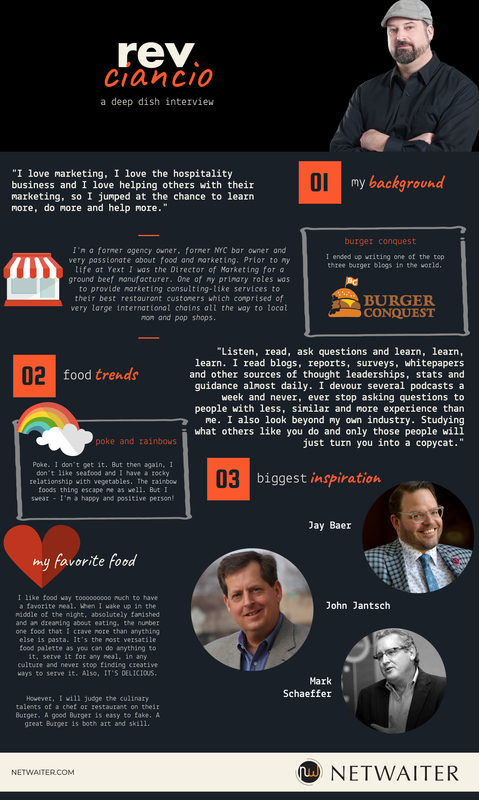 I look up to people like Jay Baer, Jon Jantsch, Mark Schaeffer, Tom Webster who not only create great marketing content but are always striving to inspire people to go deeper, be more creative and apply sensibility. In recent times, Jeff Rohrs of Yext and ExactTarget has helped me elevate my career in terms of how I think, how I create content and how I harness my experiences to help others. 5. What’s your number one piece of advice to all restaurant owners? It doesn’t matter how great your pizza is, how beautiful the picture is of your limited time offer or new item, it doesn’t matter how well trained your staff is or how much you spent on that billboard — if no one can find your business in online or voice search, you have a leaky budget. Managing your digital knowledge first, which includes your public reputation, before you spend a single dollar marketing your business in any other way, including updating your social media profiles. And never use frozen meat for a Burger. 6. For fun – what is your absolute favorite meal? I like food way tooooooooo much to have a favorite meal. When I wake up in the middle of the night, absolutely famished and am dreaming about eating, the number one food that I crave more than anything else is pasta. It’s the most versatile food palette as you can do anything to it, serve it for any meal, in any culture and never stop finding creative ways to serve it. Also, ITS DELICIOUS. However, I will judge the culinary talents of a chef or restaurant on their Burger. A good Burger is easy to fake. A great Burger is both art and skill.